The FNP Block Pin Guard is handcrafted in a variety of different metal qualities. It can be purchased in addition to your FNP nursing pin. 14k Yellow Gold Block FNP Pin Guard. 14k Gold is an alloy of 59% pure gold combined with a base metal for strength. It provides the highest quality and most durable finish. 14k White Gold Block FNP Pin Guard. 14k Gold is an alloy of 59% pure gold combined with a base metal for strength. It provides the highest quality and most durable finish. 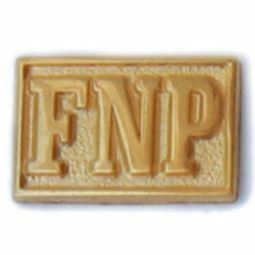 10k Yellow Gold FNP Pin Guard. 10k Gold is an alloy of 42% pure gold combined with a base metal for strength. 10k White Gold FNP Pin Guard. 10k Gold is an alloy of 42% pure gold combined with a base metal for strength. Double Gold Filled Yellow FNP Pin Guard. Double Gold Filled pin guards combine two layers of 10k Gold to the front and back of a reinforcing metal. Double Gold Filled White FNP Pin Guard. Double Gold Filled pin guards combine two layers of 10k Gold to the front and back of a reinforcing metal. Single Gold Filled Yellow FNP Pin Guard. Single Gold Filled pin guards combine a layer of 10k Gold to the front of a reinforcing metal. Single Gold Filled White FNP Pin Guard. Single Gold Filled pin guards combine a layer of 10k Gold to the front of a reinforcing metal. Sterling Silver FNP Pin Guard. Sterling Silver jewelry is 92.5% pure silver. Gold Plate FNP Pin Guard. Gold Plated pins are emblematic jewelry in which gold is electroplated onto a reinforcing metal.